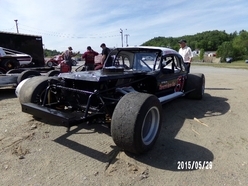 Senior Tour Auto Racers officially kicked off their 2016 season on May 20th at the Claremont Speedway in Claremont, NH. STAR filled the pits with cars from all over New England and Canada to give Claremont Speedway a night of “REAL OLE SCHOOL RACING”. It was great to see the new owners of Claremont Speedway and their entire staff joining in to give STAR a very warm welcome! The day was very busy for STAR as it was now time to get all the cars inspected before practice time. Thank you to STAR’s Board of Directors Charlie Lima, Brian Robie, and Jim Allen for getting the job done. All cars were inspected and ready to roll for their practice time and there was plenty of practice time! The evening would bring the STAR group heats and features for the Sportsmen and Modified divisions. Now it was time to get serious and get them out for their heat races. “Who would take down the first victories for the season?” First the Sportsmen hit the asphalt for their heat race. To take down the first checkered for the 2016 season and the heat win for the Sportsmen Division was Rick MacDowell from Ma in his #76 Camero. The Modifieds were lined up and ready to hit the asphalt for their heat race. It would be Brian Robie from NH in his #7 Pinto who would take down the second checkered for the evening and the Modified heat win. Back to the pits, Oh my gosh they were having a heck of a time in the pit area. Laugher and jokes going up and down the complete pit area; it was nice to see that racing still can be FUN! Then it was feature time! Oh yes STAR gave the crowd just what they have been waiting for, “REAL OLE SCHOOL FASHION RACING” from the beginning to the end. Race Director Mary Lima turned the group over to George Powers who would walk the fans back into time and show them how real racing was started….In the middle of the track! As a tradition at Claremont Speedway, George Powers started them standing on the front stretch with the cars flying by him on both sides, restoring an age old tradition to the Claremont Speedway. This is the way races were started in the early years of the sport and for the past seventeen years Powers has been doing this with STAR. The fans cheered him on and it was off to racing for the Senior Tour Auto Racers. In the Sportsmen Division it was Bob Seward from Ma in his #69B coupe to capture the victory for the Sportsmen Division. In second place was Joe Keefner from Ma in his #99 Gremlin and to finish off with a third was Charlie Lima from Ma in his #10 Pinto. The top three were brought trackside for an out of car interview and awarded with trophies. The Modifieds were in place and ready to hit the track for their feature race. Once more George Powers stood in the middle and flagged on the modifieds. The Green Came Down and it was off to racing! When the checkered came down it was on Bob Donahue from NH in his #99 Pinto to take the victory for the Modified Division. In second place was Tom Trempe from NH in the #7X Mustang and to finish off the pack with a third was Jocelyn Laliberte in his #61QC from Ouebec, Canada. The top three were brought trackside for an out of car interview and awarded with trophies. STAR would like to thank Claremont Speedway and their entire staff for all their hospitality and great night of racing!